Tri-Village sophomore Maddie Downing goes for a hard smash during a match against Dixie last Thursday. The Patriots defeated the Greyhounds in straight sets. NEW MADISON – A win is a win. When you have a young team that is playing its first volleyball game of the season – with four of your players on the roster for the first time, then yes, things are going to be dicey at times. 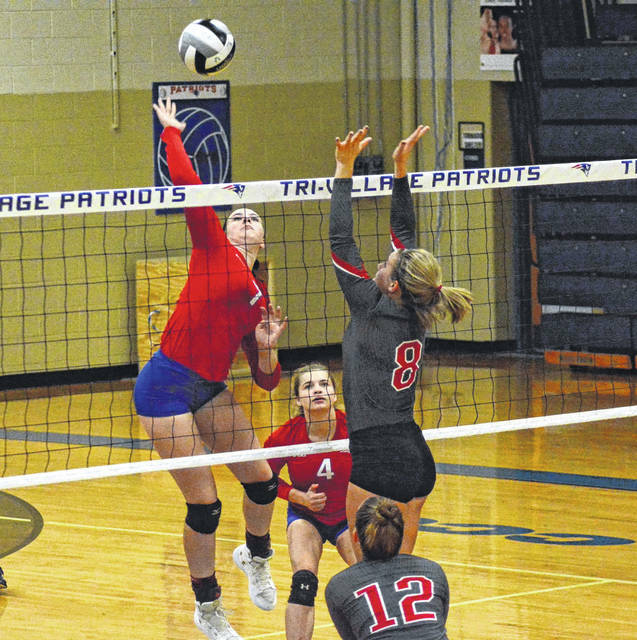 The Patriots struggled a bit but throughout the match they managed to make points when they had to and won in straight sets over the SWBL’s Dixie Greyhounds, 25-20, 25-19, 25-21. It seemed like the Patriots first set was actually their best as far as team errors and overall game play. When the team did its dig – set – spike, they really seemed to shine and after breaking a tie at 11-all, they had good front line play to get a lead and hang onto it. Sophomore Kelsie Wehr was a major factor in gaining the lead with several sizzling spikes. But in a scenario that played repeatedly during the night, the young team faltered – making some mental mistakes that allowed Dixie to rally, but they pulled away for that critical first win. In the second match the team seemed poised to put Dixie away. They had the early momentum and were up 15-8. But the young team frittered away its lead with several mistakes and Dixie went on 7-0 run to tie the match. Freshman Meghan Downing nailed a critical spike to break the 15-all tie and the Patriots went on to capture the second set. In the third set the young team showed resilience and the ability to bounce back. They allowed Dixie to get a lead about half way through the match. Dixie seemed determined to not go down in three sets. The two teams tied several times and Dixie pulled away for its largest lead of the night 12-9. But the Patriots battled back and pulled ahead. Senior Edie Morris made several big plays on the front line for the Patriots during the run. The Patriots finally took their first timeout of the night when the Greyhounds tied the match at 20-all in the critical third set following a Patriot error. After a good talking to from their coach the team closed out the last set with a 5-1 run to end the match with the victory. “I did not call hardly any timeouts on purpose. I wanted them to work it out on their own and they did,” Brewer said. “The first match nerves are past us. We have a young team – we graduated five seniors last year and this year we are playing four kids including some freshmen and sophomores, who are on varsity for the first time. I was worried about their nerves and how they would handle this. We still have a lot to work on. With the new kids it is just that we haven’t had a chance to work together much as a team except the scrimmages. But I was proud of them, it was good first game. “You can tell that there are a few players where if they make a bad pass or a mistake then it carries over. I told them afterwards that you have to have a short memory – if you make a mistake you have to go on and make a play the next time,” he added. This entry was tagged CCC, Dixie Greyhounds, girls volleyball, Maddie Downing, Tri-Village Patriots. Bookmark the permalink.